Joys Of A Wife And Mom: Want to Win A Free Ticket To The Mom And Me Fun Circuit? Come and Bring A Friend! 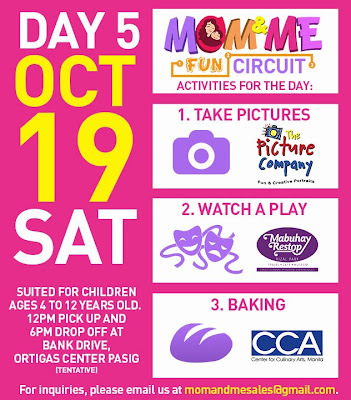 Want to Win A Free Ticket To The Mom And Me Fun Circuit? Come and Bring A Friend! Mom and Me has a new promo up for grabs for the Mom and Me Fun Circuit! 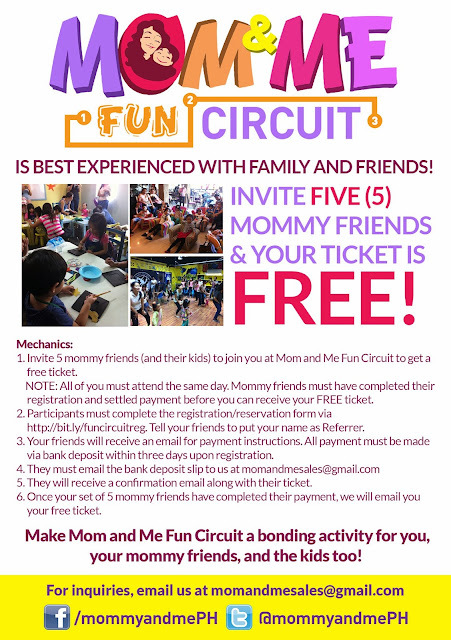 Bring 5 mommy friends to attend the Fun Circuit with you. By doing so, you can get a ticket absolutely FREE! Isn't that exciting? You not only get to spend the day with your kiddo, but you'll also be enjoying it together with your friends and their kids, too! I'm sure your day will have loads of fun! Please see this poster for details. Meanwhile, here are some news and updates. 3rd Activity: Learn Taekwondo with Coach and Kids Inc. Important Note: October 12 and October 13 activities are postponed to November 9 and 10. Keep updated on this blog and on Mom and Me's Facebook and Twitter accounts for more event details and updates. 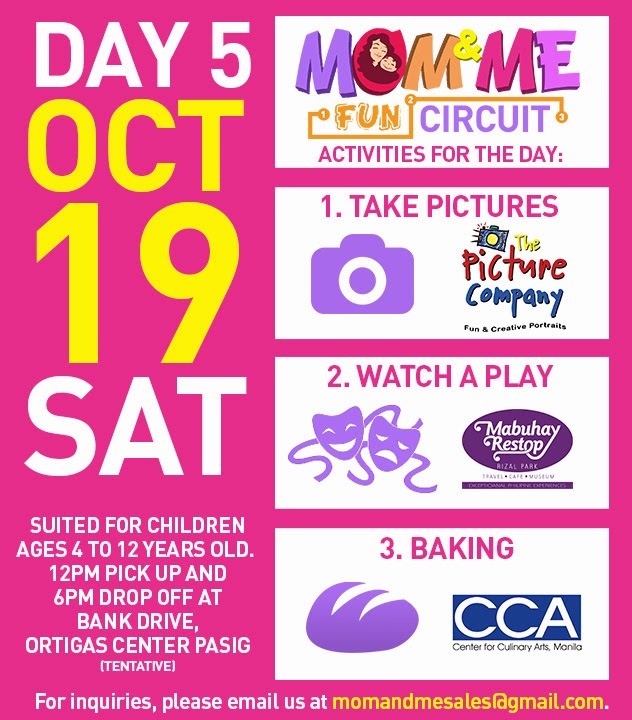 And of course, you can still go ahead and get your chance of winning a free ticket in the Mom and Me Fun Circuit Giveaway. Please visit the rafflecopter here to join. Promo runs until October 20. 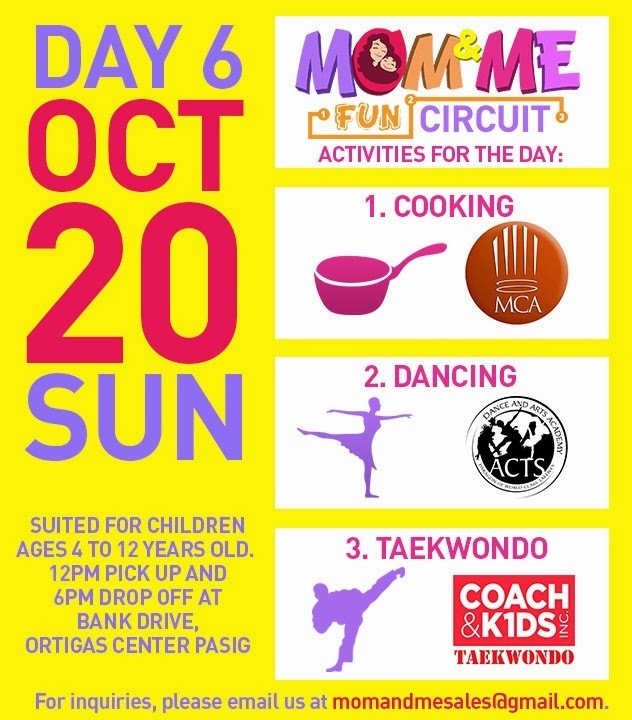 Mom and Me Fun Circuit is participated in by The Mind Museum, KidzArt Philippines, Coach and Kids Inc., Center for Culinary Arts Manila, ACTS Dance and Arts and Academy, Mabuhay Restop Travel Café and Museum, Gymboree, Moderne Culinaire Academy, Center for Pop and The Picture Company. This event is also sponsored by Del Monte Fruitastic, Enercal Plus, Bibibons, Crystal Clear, Salad Box, Tiny Buds, Burger Company, Ink Creations, Smart Parenting, Southern Living, Northern Living, Travel Life, kristn.com and wheninmanila.com.